Special 3- Airship is the Airship course of Special 3. It is based off World 2-Airship. The player starts out on an Airship, and must dodge flames from several Rocket Engines. The player then crosses a Tightrope onto a second Airship, where three Bill Blasters are firing Bullet Bills. The player then jumps onto the next Airship; it contains a ? Block with a Statue Leaf, a Rocky Wrench and several Bill Blasters that fire both Bullet Bills and Tail Bullet Bills. The player jumps onto a fourth Airship that has more Rocket Engines, before moving onto the final Airship. If the player goes down the steps, they receive several Coins from Tanooki Toads, and if they go up the stairs, the player find the Goal Pole. 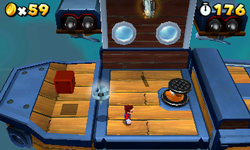 Star Medal 1: The first Star Medal is found floating above the Bill Blasters on the second Airship. Star Medal 2: The second Star Medal is found floating above a Rocky Wrench, which the player needs to jump off to obtain it. Star Medal 3: The third Star Metal is near a few Rocket Engines underneath the same Airship where the second Star Medal is.